Storage space is always a valuable commodity, but if you're downsizing your lifestyle it can seem practically nonexistent. We've discovered some great tips and tricks to create storage out of thin air! Spice racks don't have to stay in the kitchen. Use them in the bathroom to hold cosmetics and hair products. Two bookcases can serve double-duty as a headboard with storage. Add some curtains if you want the option of keeping it out of sight. This cabinet door caddy keeps your hair dryer out of sight but easily accessible. It can also be used to store toiletries or cleaning supplies. 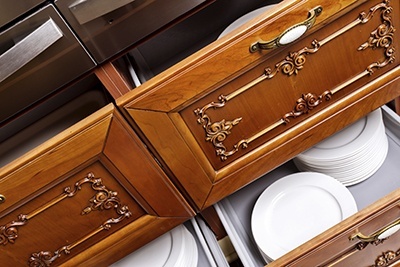 Gain space under the sink instantly with drawers or stackable containers. Lazy susans are another great option to keep small items organized and within easy reach. A tall, narrow cabinet fits perfectly in your bathroom without taking up much room. Free up space under the sink by using it to hold toilet paper and cleaning accessories. You already know that tension rods work in closets, but have you ever thought about placing them in a kitchen or bathroom under-the-sink cabinet? Use them to hang spray bottles and wash cloths. Go green without sacrificing space by hanging a bike from the back of the front door. Baskets are all-purpose storage containers that come in all sizes to fit any nook or cranny. Thanks to an endless variety of available styles, they also add a pleasing decor accent. Command hooks are a quick and convenient way to turn any wall or door into a storage rack. Ditch the jewelry box and use cork board to hang bracelets and necklaces. Using these suggestions will spark your imagination to come up with creative ideas of your own. What's the most unusual way you've transformed empty space into storage? Share your answer in the comments!